I've decided that one lucky reader should receive my super duper pretty contest entry card. This is a card I would never sell because it took so much time, energy and supplies. I doubt anyone would pay the $8+ for it that I would want to charge. However, I'm giving it away to one of my readers. Sooooo, you all have until Tuesday June 24th to leave a comment on this entry if you would like to win this GORGEOUS card. I will do the drawing around 9am Pacific Time. For comments, might I suggest you say a little Happy Birthday to my Brady. His birthday party is tomorrow. Woohoo! This card is 8.5 inches in width by 5.5 inches high. It would be an amazing gift in itself to show someone how much you care. Or accompanied with a gift, I'm sure any gal would feel like a princess! This card will come with an envelope for mailing as well. I will ship it to you if you win. Happy birthday to your little one. I have a giveaway on my blog also. Beautiful card! Someone sure is going to win a beautiful creation! :-) Best of luck to everyone! Have a fabulous weekend! Oh, and have a great time at your party, Brady. That is a truly gorgeous card. It deserves to be framed. Beautiful card! And a very happy birthday to Brady! Stunning. 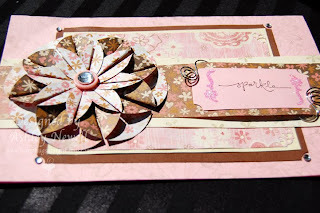 I love the card and the layers. Happy birthday! I have blog candy too! Happy Birthday dear Brady. Your mommy is very talented!